I’ve been working on a lot of saws lately for the Chestnut Creek School of the Arts Woodworking Studio as we’ve received lots of generous donations of saws (seems everyone has at least one they want to get rid of 🙂 ). Some of the saws were in fairly decent shape when we received them. However, most were in need of a lot of cleaning and other restorative work to make them functional again. As I was going through the process of removing the rust and cleaning up the saw blades for the school, I realized how little my process has changed over the years. I wrote about it on my old blog years ago, but the process is so useful that I thought I’d re-post it here. For the quick version, here’s my description of the process from my Hand Saw Sharpening Services page. As I mention in the description, it’s not a difficult process, it just takes a little time. Rust on a saw blade makes for a dirty cut, a saw that sticks in the kerf, and teeth that just won’t get as sharp as they can be. For a saw to perform at its best, the blade should be clean, free of rust, and smooth. My cleaning process starts with a soak in a rust remover to remove heavy corrosion. I follow this up by removing the loosened crud and rust with various grits of sandpaper, steel wool and a light oil. The toothline is given special attention to ensure that the teeth are clean and able to take a fine edge. After cleaning off the residual grime and oil, I finish up with a protective wax polish. I’m happy to clean your saw for you, but it’s a simple job that you can easily do and save yourself $50. So if you have a saw that is in need of a good cleaning before being sharpened, you can send it to me to do it, or you can follow the process that I do, and do it yourself. Here’s the detailed photo essay version of the process. Sorry the photos aren’t quite as large as I usually post. They’re old photos from the old blog and taken in the old shop. Here’s the candidate. This saw has a good deal of surface rust to deal with. Enough that I recommend cleaning it off before sharpening. These boot trays are sold just about everywhere for about $4. 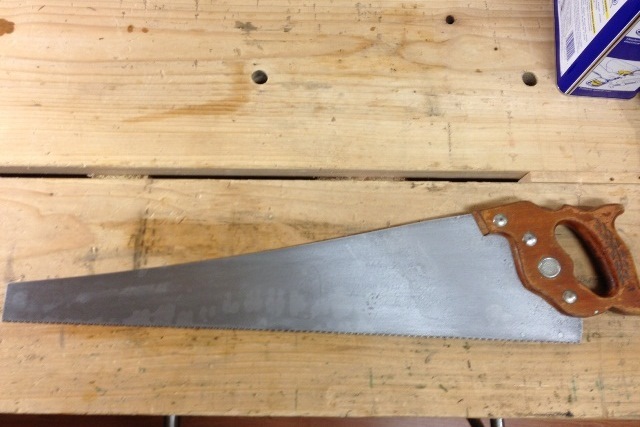 They will hold saw blades up to 26″ long. If you are planning on cleaning a saw with a blade that is longer than 26″, you may have to improvise a longer container. After removing the handle, I put the saw into a shallow pan made for muddy boots. Then I cover it with white vinegar and let it soak overnight. UPDATE: These days, I’m not using vinegar anymore. While it’s cheaper than the alternatives, it can leave weird stains on the blade as can be seen in the cleaned saw at the end of this post. So while it’s more expensive, I’ve gotten away from acids for removing rust and have switched to Evaporust because it doesn’t continue etching the metal after the rust is gone. Evaporust is also re-usable until it just doesn’t work anymore. The bubbles let you know that the reaction is working. It’s CO2 gas escaping from the solution. UPDATE: Evaporust does not bubble like this. It’s not an acid and does not off gas during the rust removal process. So if you use Evaporust (and I recommend that you do if you’d like to avoid inadvertent acid etching), don’t look for the bubbles. 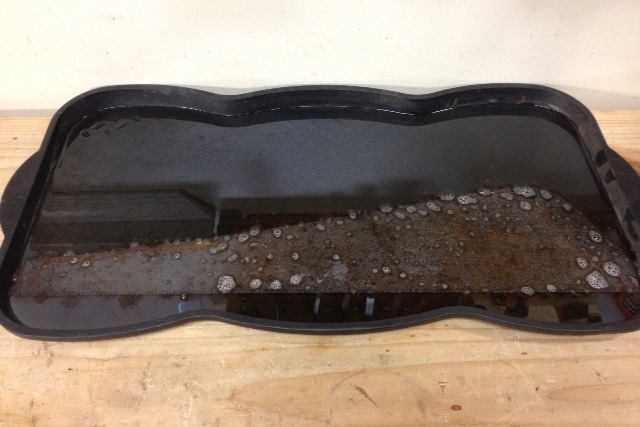 Here you can see how the acetic acid in the vinegar loosen the rust from the steel and floats it away. UPDATE: Evaporust doesn’t do this. 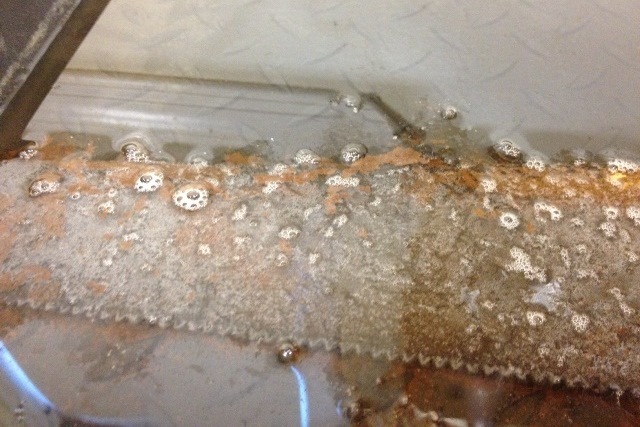 The rust goes into solution. Again, it’s a different chemical reaction, so just because you don’t see the floating scum like you do in the picture above when using Evaporust, it doesn’t mean that the reaction isn’t happening. 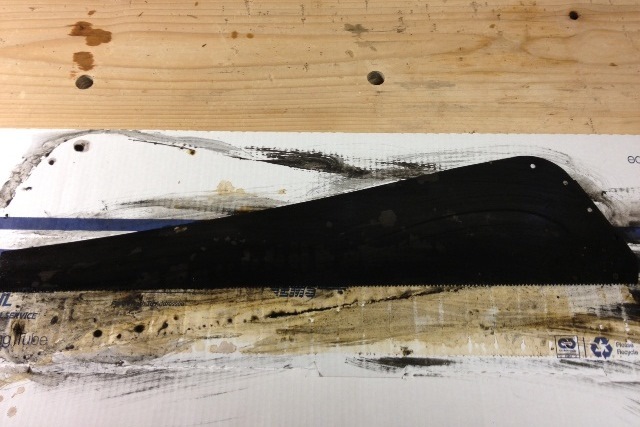 After the overnight soak, what remains on the saw blade is a black acetate. This residue easily wipes away with a paper towel, but it makes an awful mess. UPDATE: The film left by Evaporust is a little different, but there’s still a dull grey-black film left behind. It’s not quite as black as the photo above, and it will also mostly wipe away. 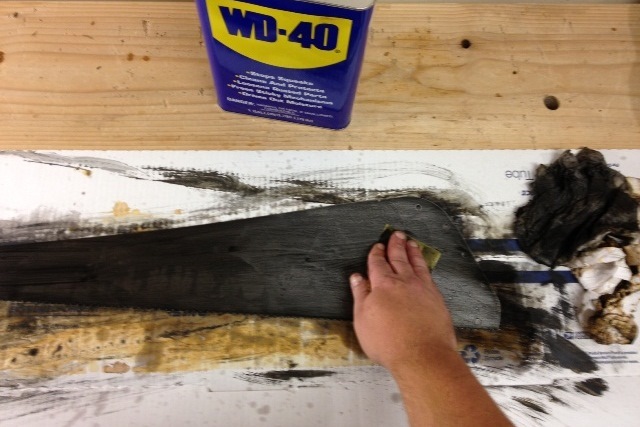 After wiping away the loose residue, I scrub the plate with a little 320 and 400 grit paper and WD-40. There are some solvents in this, but they’re not too harsh. The oil in the mix helps clean and protect the steel from further corrosion. UPDATE: This makes an awful mess and will stain your hands and under your fingernails for days. I now wear nice heavy nitrile gloves when I do this, and I typically protect the surface I’m working on with a piece of scrap cardboard from an old corrugated box. After wiping off all the oil from the scrubbing, I finish the process with 0000 steel wool and a good paste wax. The wax will wear off with use, but it helps protect the saw until it gets back to its owner. UPDATE: I still do this. But sometimes I will use some 600 grit paper followed by Brasso metal polish before the wax if the saw warrants it. If the saw will never be really pristine, I typically don’t bother with the 600 grit and Brasso because it really doesn’t improve function and adds nothing to the appearance of a saw with pitting or black stains (which are really just micro pitting). But if the blade is already close to perfect, has no pitting or staining, and I think its appearance would benefit from a bit of polishing, I will go to 600 grit paper and then Brasso before waxing. Take note if you decide to do this, however. The alkaline (ammonia) nature of Brasso will remove an acid etch with a quickness. So if you have a saw with a decent etch, skip the Brasso. This one still has a nice strong etch that was all but invisible before the vinegar bath. UPDATE: As mentioned above, I would not Brasso this blade. The micro pitting that you see causing the black staining makes it an unnecessary step, and this saw still has a nice visible etch that the Brasso would obliterate. With the handle reattached, she’s all ready to be sharpened and returned to her owner. I usually clean up the saw screws before putting everything back together. UPDATE: In this photo you can see what I think is etching/staining caused by the acid in the vinegar. The saw blade looks like it’s wet in spots, but the entire thing is dry. I’m not certain whether this is caused by the acid or not, but I’ve stopped using vinegar and I’ve not seen this happen since I’ve switched. So I’m staying the course with the Evaporust even though it costs me more than the $2 a gallon that I paid for the vinegar. If you don’t mind this look, you can save yourself some money by using the vinegar. Posted in Hand Saws, Tools and tagged cleaning saws, removing rust. 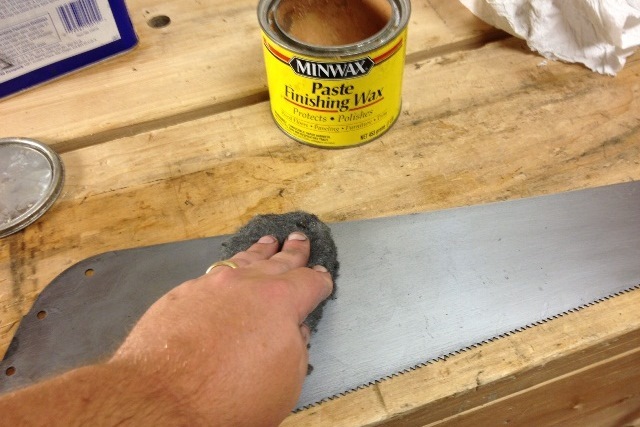 Nice write up on cleaning saw blades. Bob, I have several saws to clean up. Can you put multiple saws (2 – 3) in the boot tray with the Evaporust? Or will this not fully clean the sides of the blades which touching each other? If this doesn’t work, do you have any methods for removing the rust from multiple saws at once? I’ve done as many as 2 full sized saws and 1 backsaw all at the same time. I try not to let them overlap, but if the sides are touching each other I don’t worry about it. Haven’t had a problem yet. How does Evaporust affect the etch on the saws you have processed? It doesn’t seem to really affect it. But then I’ve never used it on a saw with a really strong etch. Most saws that are in bad enough shape to require Evaporust don’t typically have a very strong etch anyway. 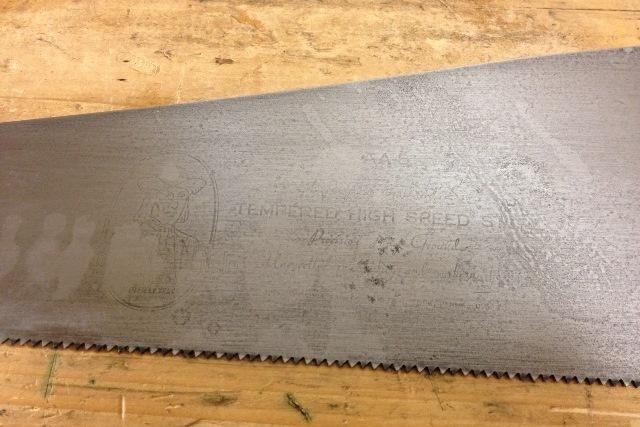 Do you have/know any way to restore/darken a weak etching in a saw blade? I’ve heard that some people will try cold gun blue solution. I’ve never tried it myself. 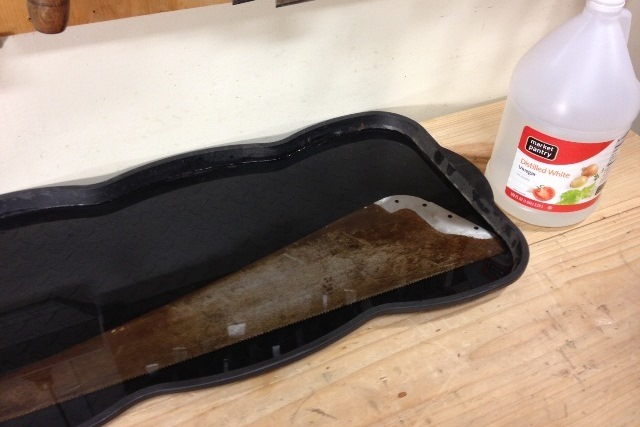 To neutralize acid on tools soak in water with bi-carb for 10minutes, wipe and oil. Hadn’t thought of a wax polish but might(?) explain saws that after several immersions and working with fine steel wool still have oily reflecions. P.s. Use a non ferrous brush for near the teeth lengthens the life of the wool which should be S.Steel (ordinary dies quickly). Neutralize acid on these ditto. Wooden handles removable. Plastic not?. Cursory investigation on internets suggests you could soak it complete without problems for most plastic. Use chemical resistant gloves – stain is hard to get off your finger tips. 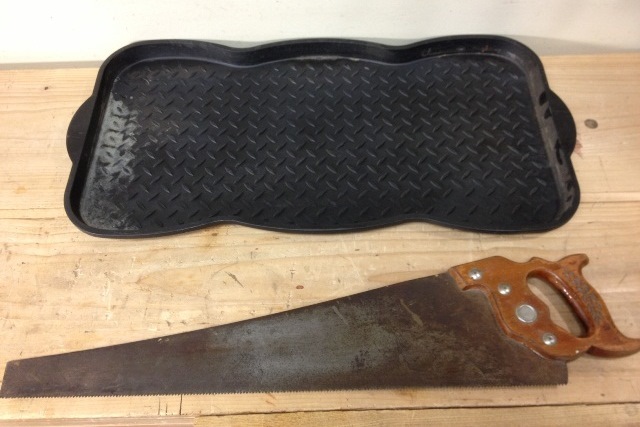 I have a long 2 person cross cut saw… it has some surface rust.. I want to remove only the surface rust and leave the patina.. I don’t want to take it to the bare metal it’s for display only and will never be used… any suggestions? You can use a razor blade and just scrape the surface rust off if that’s all you want to remove.